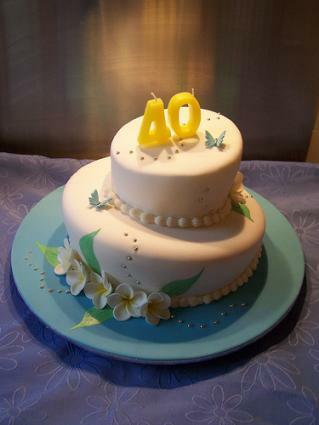 Looking for some creative and unique 40th birthday cake ideas? You're on the right track! If you know someone who's about to go "over the hill," try livening up the birthday celebration by making a special custom cake for him or her. Choose a cake that you're comfortable with making. If you're just beginning to decorate and don't have a lot of supplies or haven't perfected your skills, pick a simple design that you can do successfully in a short amount of time. Consider the personality of the birthday celebrant. Does he or she love wild colors and patterns or kitschy cake toppers? Choosing a design that's suited to him or her will make for a truly memorable and successful cake. How many people do you want your cake to serve? Tailor the size of what you make to the number of people who will be at the party. Will you have to transport your cake to the celebration? If so, you may not want to pick a multi-tier design unless you plan to assemble it on site. A number cake is a fun choice for an intermediate decorator who is comfortable with slicing and shaping flat cakes. To make the design, bake two 9-inch by 13-inch rectangular cakes, and carve off the curved tops with a cake leveler or long serrated knife so that the cakes are flat. 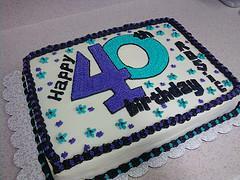 Carve a "4" out of one cake and a "0" out of the other. You can do this by attempting to carve the full numbers out of the cakes or patching together parts of each number with large pieces of cake. If you don't trust your freehand carving skills, trace the numbers onto a piece of parchment paper, cut them out, place the paper on top of the flat cakes, and trim the outlines with a serrated knife before carving them out fully. Arrange the numbers on a flat serving board or platter and cover them with buttercream frosting or fondant. Why not poke a little fun at a friend who's getting up there in age? For an over the hill cake, you'll need half of a sphere baking pan or a round oven-safe bowl, some gel food coloring to tint your frosting, and a flat spatula to frost your cake. Bake half of a sphere cake, and let it cool. Flatten the bottom with a cake leveler or long serrated knife. Place the cake with its round side up on a flat platter or serving tray, and coat the cake with green buttercream frosting. You may need to apply a crumb coat first to make the layers as clean as possible. Smooth out a final layer of green frosting with a flat spatula. To make the texture of the cake rough so it looks as if the hill is covered with grass, squeeze out more green frosting with a pastry bag, coupler, and the grass tip, or swirl the smooth layer of frosting with several toothpicks. You can also add flowers or patches of grass to the cake if you like. With a pastry bag, coupler, and small round tip, pipe "Over the Hill!" and any other message you want onto the cake. A sheet cake is a great choice for a beginning decorator, since it provides a large flat surface to make designs and pipe messages, and there's no shaping or carving involved with it. Bake a 9-inch by 13-inch cake, and let it cool completely before frosting. Add a crumb coat to the cake, let it firm up, and then add a final frosting layer and smooth it out with a flat spatula. Before you pipe on your birthday design, sketch it out on a piece of paper until it looks the way you want it. Using your sketch for reference, pipe the lettering or graphics onto the cake with a pastry bag, coupler, and frosting tip. If you'd like, you can outline the designs and lettering with a toothpick before you pipe on the frosting so that you have a template to follow. These 40th birthday cake ideas are just a few that will make dessert extra special on the day your friend or relative turns the big 4-0. 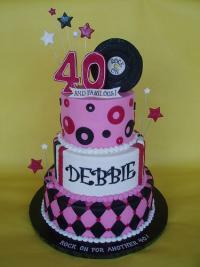 Try one for the next milestone 40th party coming up in your social circle.